Located in the deep inlands of southeastern Korea, Gayasan was designated as the 9th national park in Korea in 1972. Gayasan was well-known as one of the 10 most beautiful spots in the East Sea area and as one of the eight scenic wonders of the Joseon dynasty. The total area of the park is 77㎢ and it borders hapcheon-gun and Geochang-gun of Gyeongsangnam-do, and Seongju-gun of Gyeongsangbuk-do. Some call the highest peak of the mountain Sangwangbong(1,430m). Another name of the peak is called Woodoobong because its shape looks like a cow’s head. 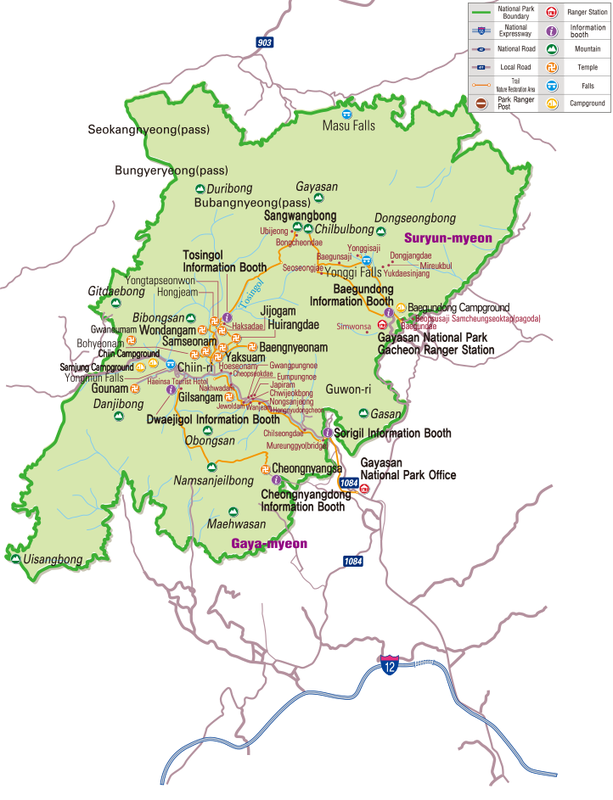 Gayasan has a mountain area composed of anorthosite and a valley area (Hongnyudong and Baegundong valleys) mainly made up of granite. As the sacred site of Buddhism, Gayasan has many historical and beautiful spots such as Haeinsa(Temple), Palmandaejanggyeong(Tripitaka Koreana, Buddhist Scriptures), and the Hongyudong valley. Known as a mountain of wisdom and morality, the mountain has attracted many visitors. Gayasan has 590 plant speies, 22 mammal species, 61 bird species, 11 amphibian species, 5 reptile species, and 423 insect species,. It also has 18 Korean native species and 10 endangered species designate by the ministry of Environment such as the Solnari (Lilium cernum), the Chickweed wintergreen, and the Woodland peony.